Posted By PA Breast Cancer Coalition on May 31st, 2017 at 9:32 am | 0 comments. The U.S. House of Representatives in Washington recently voted to repeal and replace the Affordable Care Act, also known as Obamacare, and to replace it with a new law. The bill that passed the House of Representatives, called the American Health Care Act, also known as Trumpcare, removes federal health insurance protections for people with pre-existing conditions like breast cancer. Instead, individual states would be able to create high-risk pools which did not work in the past and will not work now. That means, if you have a pre-existing condition like breast cancer, you may be denied health insurance or charged more for your care. 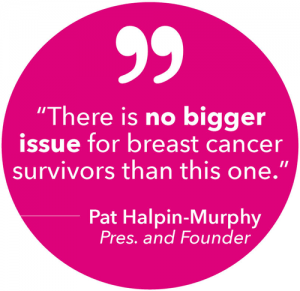 Will you help us save federal health insurance protections for people with breast cancer? Thank YOU for your passion and determination on this important issue. 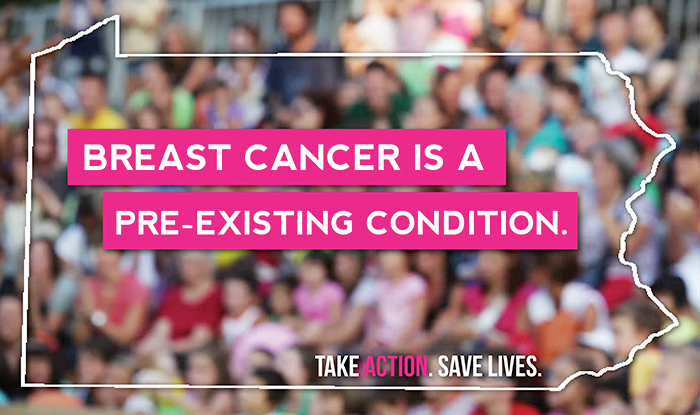 Together, we can make a difference for people with pre-existing conditions like breast cancer. Take action. Save lives. Posted By PA Breast Cancer Coalition on May 16th, 2017 at 2:54 pm | 0 comments. The PA Breast Cancer Coalition represents hundreds of thousands of breast cancer survivors and their families across the state. For that reason, we need to tell you about something important happening right now in our country that will affect you, your family and your health insurance. Recently, the U.S. House of Representatives voted to pass the American Health Care Act, also known as Trumpcare. This bill would repeal and replace the current Affordable Care Act, which is also referred to as Obamacare. If that happens, we will no lo nger have FEDERAL health insurance protections for people with pre-existing conditions like breast cancer. Instead, the decision to cover or not cover pre-existing conditions would be left to individual states. States can put people with pre-existing conditions into “high-risk pools” where insurance companies can charge people more money for health insurance, if they are covered at all. We had high-risk pools before and they did not work. We cannot let this happen for breast cancer survivors and others with pre-existing conditions. It could mean the difference between life and death. We want to thank the Pennsylvania congressmen who voted against the bill which removed federal health insurance protections for people with pre-existing conditions. That bill is called the American Health Care Act (AHCA) / Trumpcare. Now, the bill is in the U.S. Senate. U.S. Senator Bob Casey has said he would vote NO on any bill that removes federal health insurance protections for pre-existing conditions and, in January, introduced his own amendment protecting Pennsylvanians with pre-existing conditions like breast cancer. U.S. Senator Pat Toomey has not yet taken a position on whether to save federal coverage for people with pre-existing conditions. Posted By PA Breast Cancer Coalition on February 2nd, 2017 at 11:30 am | 0 comments. 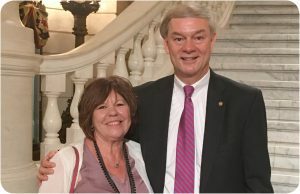 Pennsylvania breast cancer survivors who suffer from lymphedema shared their personal stories and struggles with the U.S. Senator Bob Casey during a roundtable Friday, January 27, 2017. Together, they are fighting for Medicare coverage of lymphedema supplies like garments and sleeves. Stage III breast cancer survivor Jeanne Schmedlen of Lemoyne (pictured in the photo on the left) lives with the condition every day. She brought her mechanical compression garment to share with the Senator and explain the high costs associated with lymphedema maintenance. 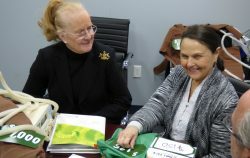 Survivor Peggy Grove of Harrisburg (picture on the right, next to Jeanne) has spent tens of thousands of dollars out-of-pocket on sleeves, gauntlets and machines to care for her lymphedema. 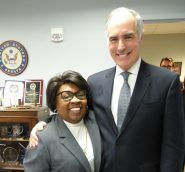 Brenda Mitchell of Philadelphia (pictured on the right with Sen. Casey) also shared her story during the roundtable. She took part in a year-long clinical trial during which she was given supplies for her lymphedema. Now that the trial is over, Medicare will not cover the high costs for her garments. Posted By PA Breast Cancer Coalition on October 17th, 2016 at 3:53 pm | 0 comments. This past year I was humbled and honored to receive the PA. Breast Cancer Coalition Pink Ribbon award, their highest award, and dedicate it to my sister-in-law fighting a rare form of inflammatory breast cancer. Every woman who conquers breast cancer has an amazing story to share of their journey. The one common thread in every story is that early detection saves lives. October is “Breast Cancer Awareness Month,” and it’s hard to forget with pink ribbons, ties, and professional athletes wearing pink. The statistics bear repeating. One in eight women in the United States will be diagnosed with breast cancer in her lifetime. Breast cancer is the most commonly diagnosed cancer in women and is the second leading cause of cancer death among women. Each year, more than 246,660 women and 40,000 men will be diagnosed with breast cancer in the nation. One statistic that is trending in a positive direction is the number of people – 2.8 million – who are breast cancer survivors. They are living full lives after having been diagnosed. 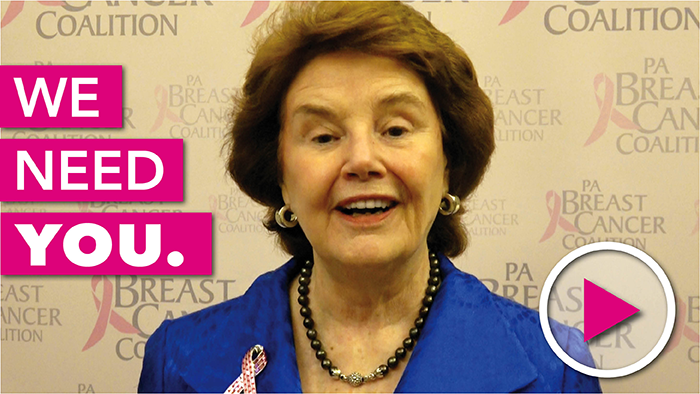 Pennsylvania is making strides in the continued effort to support those who have been diagnosed with breast cancer. 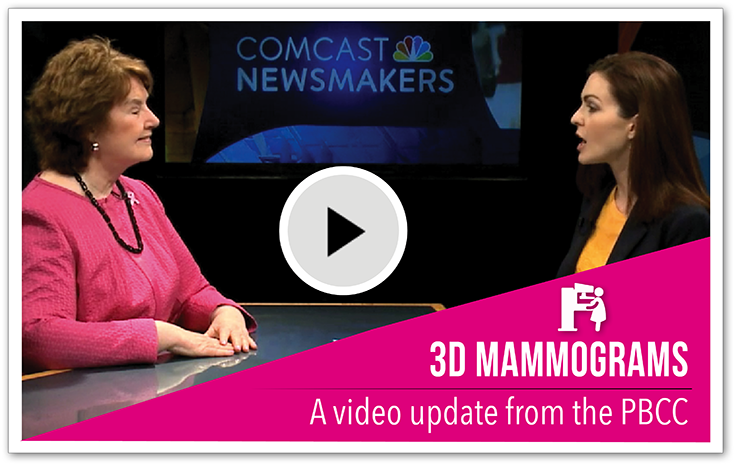 The Breast Density Notification Act requires mammography providers to notify women categorized as having dense breast tissue and about their condition. Knowledge is power and this law has improved detection and prevention by educating patients about dense breast tissue and how it could conceal possible abnormalities during mammographic procedures. 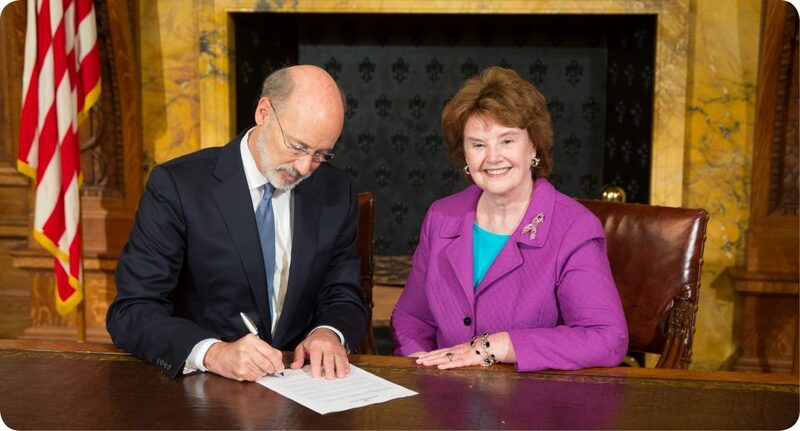 In July Pennsylvania became the 42nd state to provide patients equal access to anti-cancer treatments with the enactment of oral chemotherapy legislation (Act 73 of 2016). 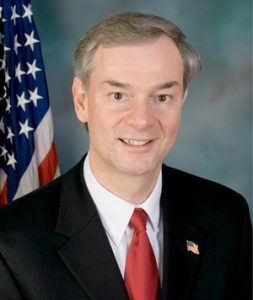 I was proud to author the enabling Oral Chemo Parity Legislation (House Bill 60). Chemotherapy can have a violent effect on the human body as it does its job. Oral chemotherapy drugs are often as strong as those administered intravenously and may have fewer side effects. In some instances, oral medications are the only form of chemotherapy a patient can handle. There is also the financial impact. Prior to Act 73, orally-administered chemotherapy was covered under a health plan’s pharmacy benefit, which required patients to pay a percentage of the total cost of the drug (generally between 25-30 percent). This created an enormous financial barrier for patients to access these drugs prescribed by their cancer physician for treatment. Act 73 prohibits insurance policies from placing oral anti-cancer medications on a specialty tier or charging a copay for the medication. Hopefully, these measures will help in saving lives and make treatment of breast cancer more tolerable and successful. The end goal is to eradicate this disease. Continued support of innovative and high-impact research will someday hopefully lead to the cure.